In November 1959 the state of Kansas was shaken by news of the murder of the Clutters, a family of four living in a lonesome hamlet called Holcomb. Many worlds away, in Manhattan, novelist Truman Capote was soaking in the recent success of Breakfast at Tiffany's. The book had added to Capote's reputation and he was now a high-profile member of New York's upper-crust literary circles, a raconteur with a talent for becoming the central point of any room he was in. He was at a stage in his career where he could simply call up The New Yorker's editor William Shawn – a mentor to some of the finest young writers of the age – and inform him that he wished to travel to Kansas to research for his next article. This is in fact what Truman did, for the Clutter murder story had ignited something in him. What that something was and what effect it would have on his life and career is the subject of Bennett Miller's Capote, a stunning portrayal of the writer as parasite, feeding off the tragedies of others, and of the loss of humanity in the pursuit of art. Capote covers six years in the author's life – the time that went into the creation of In Cold Blood, his "non-fiction novel" which broke new ground by marrying journalism with literary fiction. This book would seal his reputation as one of America's leading writers – but it would exact a heavy toll too, beginning a downward spiral that would end with his death (of a drug overdose) in 1984. He would never publish another novel. Capote begins more or less with Truman traveling to Kansas accompanied by his childhood friend Harper Lee (a year away from achieving fame herself with the publication of To Kill a Mockingbird). They visit local residents, make notes, get themselves invited to dinner by the agent investigating the Clutter killings. Throughout, there is little sign of emotion on Truman's face – not even when he lifts the lid off one of the coffins in the funeral home and peers inside. His eyes merely dart about as he registers details and commits them to his memory ("I have 94 per cent recall value," he often boasts; he can recite the contents of an entire magazine page after having read it once). Even so, at this stage Truman's actions aren't indicative of anything more than an author being slightly over-meticulous in his spadework. But this soon changes: the two murderers are caught and Truman finds himself becoming increasingly interested in one of them, Perry Smith, a tortured young man whose childhood closely resembled Truman's own. Over a series of meetings they form a strange bond. Truman wins Perry's trust, helps the two men find lawyers to appeal their case. Their execution is stayed once, then again. This suits Truman – he has decided to develop the article into a full-length book and he needs Perry alive for as long as possible so he can get the full story. Later, the situation will be reversed: for In Cold Blood to get its dramatic ending, it will become necessary that the two killers be executed. For all that he has, in his own way, become attached to Perry, Truman becomes a nervous wreck at the thought that he might not get the death penalty after all. 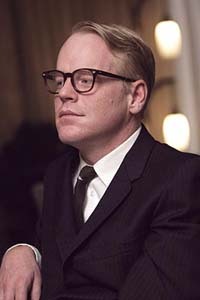 People who knew the real Capote have hailed Philip Seymour Hoffman's imitation of the man's effete, affected charm and his ability to be an urbane New Yorker and an excited little boy all at once. But the imitation, splendid though it is, is almost secondary: this performance is entirely convincing on its own terms, even if you have no idea who Truman Capote was. Hoffman paints a picture of growing obsession but does it with incredible subtlety, without resorting to any of the usual acting tricks that go with that emotion. For the most part Truman's face is a blank mask as he absorbs the details that he can use in his writing. The first glimpse of vulnerability we see from him comes when William Shawn praises the first two chapters of his manuscript. The same deep-rooted need to be appreciated and admired also comes across in the intensity with which he reads excerpts from his novel out to a large audience in an auditorium (a scene that is chillingly intercut with shots of Perry looking out of his cell window as another inmate is taken away to be executed). Special mention must also be made of Catherine Keener as Harper Lee; her performance provides an emotional and moral grounding to a story that has such an unlikable man as its protagonist. Watching her, it's easy to imagine that this is the woman who wrote the most graceful of books, the woman who created Atticus Finch. By default, as a close friend and confidant of Truman, she also gives us a perspective on him that the film doesn't otherwise provide. Capote is a film that is as still on the surface as the desolate Kansas plains themselves. Except for a brief recreation of the murders near the end (arguably necessary to remind us not to feel too sympathetic towards Perry), there is scarcely even a raised voice to be heard. But there is violence beneath the film's surface: the violence that comes from the clash between literature and life, from a man pursuing his art so relentlessly that it's possible for us to see two murderers as his victims, and to wonder whether "In Cold Blood" might have been an apt title for more than one reason. This is also a film that's more than the sum of its parts: when it's over, what you remember is the overall impact rather than specific scenes. But the final moments, the scene of Perry's hanging, with Capote forcing himself to watch the execution (is this his pathetic stab at atonement? ), stay with you. Tears slide down the author's cheeks and you can't help wonder: is he crying for the young man whom he felt such a connection with and whose trust he repeatedly abused for his own gain? Or are the tears for himself, for his knowledge of what he's become, for the price he's paid to produce that one book? P.S. Do try to read In Cold Blood before watching Capote. Did you not find it slightly ironic that a movie blaming Capote for exploiting Perry's story itself exploits Perry's story? Have you seen the original In Cold Blood movie? If so, what do you think of it? I haven't yet read the book but will do so soon. the best part of the film was the outdoor scenes of kansas countryside. I mean, everything looked so calm and serene and yet you could sense that it was all ominous and foreboding of some darker things lying beneath. I had seen the original In cold Blood a month before watching this movie at a revival on big screen and I had some trouble paying attention to the dilemma facing the writer. My thoughts were invariably stuck on the two murderers and the hapless family they slaughtered (for forty dollars and a a radio). the original film chillingly recreates the violence. it is very powerful and once seen you can never forget the "old gentleman", his ailing wife, son and that very beautiful teenage daughter and their senseless murders. I understand that the film's subject was not the murders but an exploration of the dilemmas of a writer, but to me at least the subplots overpowered the main thread of the narrative. i think even capote has those lines attributed to perry, "Mr. Clutter was a fine old gentleman, I was thinking it even when I was slitting his throat". In the original film it is just a shattering scene. also in capote, the perry character doesn't come out very well. the screenwriters just treated him as an adjunct to capote which was wrong. I wonder what it says about our current cultural obsessions that today we are more fascinated by a celebrity journalist than by a pair of murderers willing to kill for no compelling reason. Unfortunately, by the time I got into the theatre the movie was well into the first ten minutes and only the front row seats were left. It was just excruciating pain after that. I didn't understand what the movie was, fell asleep a few times and was waiting for it be over. The only excitement was to see Harper Lee -- if not in a person, played by an actress. I will try to make an effort to watch it again. good review, jai. we came out of the movie theatre completely, utterly drained. its a remarkable insight into a writer's head, and the movie works excellently on that tone. i read the book but haven't seen the movie, yet. the review,i think captures the essence of the main character.. but capote is a writer i admire, so i wish you were kinder to him because his writing definitely brought in an air of irreverence to the craft..and i don't mean only his didain for grammar. 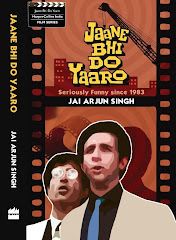 and what about the whole army of writers who tried to imitate this genre-spawning book of his ? give him credit for being original. Kuffir: what I wrote in the review wasn't intended to be a summary judgement on Capote's life or work - it was simply an examination of one specific aspect that the film looks at. No question that he was a superb writer - and if you read In Cold Blood you see a lot of concern and empathy for all the protagonists, even though he's clearly more interested in Perry than in the others. Bina: no I haven't seen the original In Cold Blood yet - have wanted to for a long time but haven't been able to get hold of it. I finally watched Capote. For me as well, the acting of Hoffman was the highpoint in the movie. A great movie! Philip Seymour Hoffman deserved the Oscar he got for his role. I hope it won't be his last! I agree about the Faustian exchange nature of the movie. However, was it just me, or did you notice how Perry and Truman mirror each other. There were times I felt that Perry was playing Truman throughout, trying to palm off the sentence on his partner. This idea seemed to be borne out by his sister warning Truman to be wary of him. They were very alike (including their background) except for Truman's privilege as a successful writer. Also, there was the thing about expectations. I thought that was pretty interesting. Truman felt that people were always trying to peg him down and he is constantly driven to prove them wrong. Moving from "Other Voices, Other rooms" to "Breakfast at Tiffany's" to "In Cold Blood." Perry on the other hand behaves exactly in the way people expect him to, including the crime that landed him in jail. His description of the farmer before he shot him was heart-breaking. The suddennes and the silence of the only violent scene in the movie enhanced the effet. Related:Seymour Hoffman is playing a version of L.Ron Hubbard in "Masters." Have you been to the advanced screenings (film critics' privileges)? It looks interesting.